1) Spent 12 months with an international volunteer organization that had me stationed in two Filipino villages for the first six months and then a little town in Swedish Lappland that was 80 miles from the Arctic Circle and so far north that people cared more about their snowmobiles than they did about their cars. I taught English, worked with kids and built several lasting friendships. 3) Taken a year out of college in the United States to work doing Public Relations, recruiting and some teaching at the international boarding school that I had attended several years prior in Watford, just north of London. 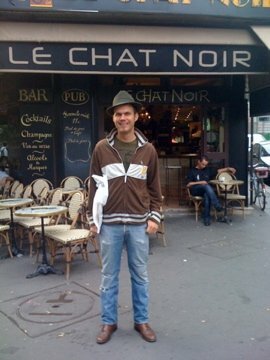 4) Spent a semester studying Spanish in Buenos Aires, Argentina. In addition to all the language classes I went to Tango shows; survived the madness of a River-Boca match (the biggest soccer rivalry in Argentina) and dodged some genuinely energetic political protesting, complete with gas bombs. 1) A Clean Slate – For better of for worse, relocating abroad gives you a chance to start from scratch. Yes, this means starting from ground zero to build a social circle and to get to know the neighborhood. But it also means that past missteps and complicated messes are behind you and you have a completely new opportunity to create your life. Build it from the ground up. The first time I was abroad I took advantage of the clean slate to transition from being a 16 year-old high school nerd to a far more independent and socially courageous 17 year-old. 2) You are more receptive to learning abroad – Where you might tune out mentors and helpful friends at home due to long-developed biases, the newness of being abroad means that you are grateful for those that help you and you learn more readily about the culture around you. I found that while I was highly critical of my own culture and society, going abroad allowed me to rest that sense of cultural self-critique and genuinely enjoy learning from those around me because what they brought to me was fresh and new. 3) Language acquisition helps you understand a new way to be human – You cannot begin to understand culture and people before you understand their language. And the beauty of different languages is that they allow for different expressions of what it means to be human. When you start to learn languages you begin to realize that certain sentiments can only be correctly expressed in certain languages… Try translating a Spanish love song by a popular artist like Shakira into English and you’ll see what I mean – beautiful in Spanish, cheesy in English. 4) Negative home influences are nowhere to be found - I’ve noticed that I have a tendency to get complacent when my surroundings get too familiar. I find a niche of friends, carve out a comfortable life rhythm and settle into a little too much of an autopilot existence. The negative attitudes, limiting beliefs, low expectations and general monotony of everything around me threatens to become part of me. Travel has helped me shake this cloud of mediocrity. With travel my surroundings change, I meet happy fellow adventurers and I am constantly confronted with exciting new ideas. Travel is a great way to jump start life when it seems to grind to a halt. 5) You are who you say you are – As much as it is “important to be yourself”, it is equally true that you can define and redefine yourself throughout life. In no context is this more true than when you are on the road. I’ve noticed that international service projects in particular are great because you can seize them as opportunities to become who you really want to become, a better person. Whether you end up become more self-aware or whether you successfully learn to be a very different person from emulating the life of an excellent service-minded mentor, travel provides a great new environment to focus on service and intentional development. I would love to hear your top reasons for taking a year out abroad. Leave me your thoughts by leaving a comment!